Every year, Jews around the world gather to celebrate Passover by participating in a Seder. Guests join together to retell the story of the Exodus from Egypt and then enjoy a festive meal with family and friends. Though the Seder typically takes place at home, rather than in the communal setting of the synagogue, it is, according to many statistics, one of the most widely observed Jewish ritual practices today—even among Jews who are otherwise non-observant. Everyone shares in reading from the Haggadah, a special book that depicts the story of the Israelites' Exodus from Egypt; the Haggadah also explains the Seder rituals and traditions, which mainly are represented by different foods. Pesach, as the holiday is known in Hebrew, occurs in the Spring, usually sometime in March or April. In Israel, the Seder is held on the first night of Passover, while in the Diaspora (everywhere else in the world) it is celebrated on the first two nights of the holiday. Families will have a Seder on both the first and second night of Passover. The Seder begins with reading from the Haggadah and guests do so until they reach the specific place in the book where it says to serve the meal. After the main course is complete, it is time to return to the Haggadah to finish the Seder ritual. There are several special dishes and foods that need to be placed on the table in order to properly perform the Passover Seder. The most prominent item is the Seder plate. The Seder plate holds small portions of six ritual foods, which are referenced (and sometimes tasted) at various points during the Seder. There is also a plate holding three ceremonial pieces of matzot that are tucked into a special cloth envelope with three sections (or layered in a napkin folded to create three sections). These three pieces of matzot represent Cohen, Levi, and Yisrael, the three castes that make up the Jewish people. There are moments in the Haggadah where we are directed to use these pieces of matzot. Over the course of the Seder, the Haggadah directs us to drink four glasses of wine. Therefore, wine plays an important part of the Seder and should be available on the table. Depending on the host, kosher wine may be served. Setting out a glass of wine for the prophet Elijah is also a Seder tradition. Elijah (or Eliyahu) is believed to be the harbinger of the Moshiac (Messiah). Passover Seder hosts also open the front door to invite Elijah in to join the proceedings. Setting out a cup of water for the prophetess Miryam, Moshe's (Moses') sister, is a newer tradition and acknowledges the importance of women in the Passover narrative. In Miriam's merit, a spring of fresh water was present for the Israelites during their desert wanderings after the Exodus from Egypt, hence the water in her Seder cup. Each of the six foods on the Seder plate has a symbolic reference to the story of the Exodus from Egypt. Many homes own a Seder plate that features six labeled indentations indicating where each food should go; you can also simply place the foods on a plain dish or even a paper plate that has been marked up. One of the symbolic foods is karpas. This raw green vegetable or herb, often parsley, represents Spring. It is usually eaten dipped in salt water which symbolizes the tears of the Israelite slaves. Charoset is a mixture of fruit, nuts, and wine; it is meant to represent the mortar used by the slaves in Egypt to build the pyramids. Maror, or bitter herbs, are eaten to remember the bitter lives endured by the Israelite slaves in Egypt; this is almost always horseradish. A roasted lamb shank, called zeroah, represents both the lamb the Jews sacrificed the eve of the Exodus and the arm of G-d. Eggs also play an important part of the Passover Seder and a roasted egg (betzah) has a place on the Seder plate. It represents the festival offering brought to the Temple in ancient Jerusalem as well as Spring and renewal. In addition to the Seder plate, three matzot, and the cups for Elijah and Miryam, there are a few additional symbolic foods and drink present at the Passover Seder. Found in the Haggadah is mention of the korech, a "sandwich" made of matzo and maror, originated by the renowned sage Hillel. Sometimes families include a bit of charoset in the sandwich. Many families also have the tradition to serve hard boiled eggs in salt water at the start of the festive meal, because eggs are symbolic of the cycle of life. When it comes to the type of matzo, many people use shmurah matzo—literally meaning guarded matzo—which is supervised from the time of harvest through baking to ensure that the grain never comes in contact with water or ferments, which would render it chametz (prohibited foods during Passover). These matzot are handmade and have a distinctive round shape, sturdier texture, and more rustic appearance than machine-made square matzot. After the first reading of the Haggadah, a festive kosher-for-Passover meal is eaten. Depending on whether the host is of Ashkenazic or Sephardic origin will determine what types of dishes are served, and what foods are acceptable during Passover (for example, Sephardics eat rice while Ashkenazi do not). The meal often begins with a soup, such as matzo ball soup, and sometimes an egg drop soup (hard-boiled eggs in cold salt water). Next is a fish course like gefilte fish. This is a blended mixture of a minced whitefish (such as pike) and onion, seasonings, and herbs that is molded into individual loaves and then poached. It can be sweet or savory and is served with horseradish. 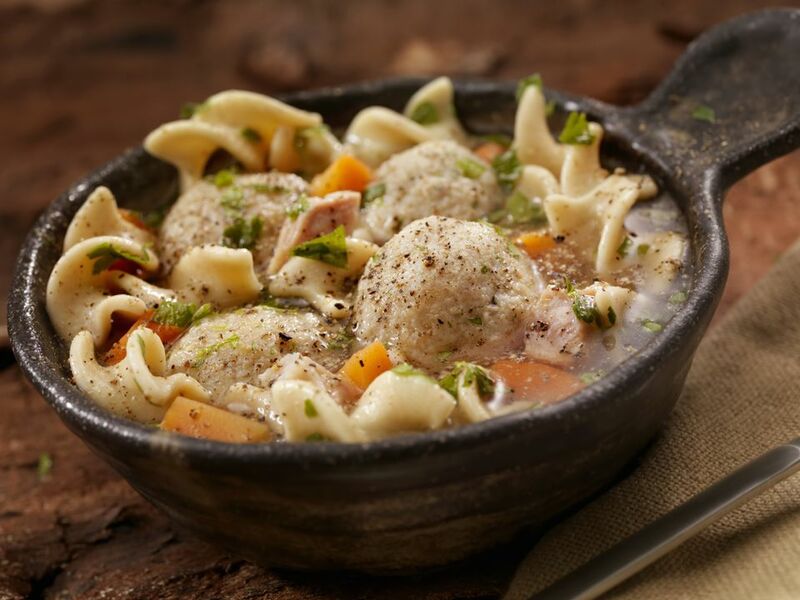 Although you can really serve anything for the Passover dinner—as long as the ingredients are kosher for Passover—there are a few recipes that are traditional. Sweet brisket, for example, made with ingredients like cola or chili sauce, is a quintessential centerpiece, as is a roasted chicken. Since a starch including flour is not permitted, potatoes are a ubiquitous side dish; they can be as simple as roasted potatoes, made into Passover potato latkes, or prepared into a casserole like a kugel. Although almost any vegetable will do at the Passover meal, there are a few that fall under the category of kitniyot, which includes legumes, beans, peas, rice, millet, corn, and seeds. There are some Ashkenazi Jews who choose not to eat kitniyot (foods that can be pulverized into a flour) on Passover, so peas, corn, and beans may be eliminated from the menu. That still leaves plenty of other choices, though, such as Miriam's red cabbage and colorful cauliflower. Asparagus and artichokes are always a nice idea since they are Spring vegetables. Dessert can be a little tricky since so many contain flour or rise when baked. However, there are plenty of kosher for Passover and gluten-free cakes and cookies that are delicious and perfect to serve at the end of the festive meal. A dried fruit compote or a fresh berry salad is also a wonderful accompaniment to the dessert selections.